It is with great pleasure that we have been invited to sell Asas Tomtebods. 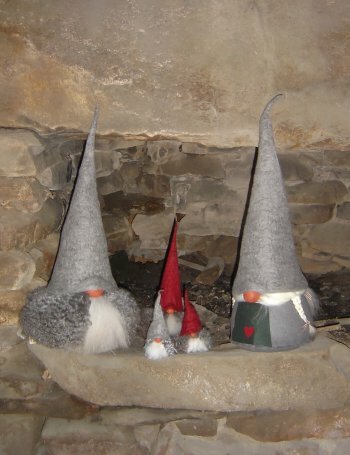 These Tomtebods are made in Sweden and are of the highest quality. 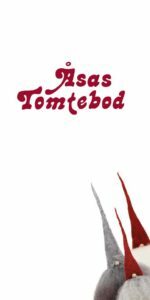 You can see Asas Tomtebods website by going to our link. Items may vary slightly in appearance as they all have their own personalities and characters. Quote from Asa’s Tomtebod Homepage. 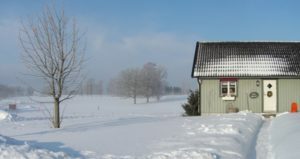 In 1993, Asa’s Tomtebod was Founded in this little house in Örnaholm. We still manage to produce most of our products here, but since the start we have expanded the building. Although the business has grown, the products are still handmade and strictly materials from nature. Nowadays, we do not sell to private persons here. Instead our products are available at our retailers. Big sellers are our Santas (Santas Beard and Gnomes), but the range is also slightly different, and each year we try to create something new. The sheep from the Swedish island of Gotland are unique. Using their curly grey wool along with warm water and soap, we create a felt that is then handshaped into caps and noses. The sheepskin is turned into beards and hair. We also use sheepskin from Icelandic sheep, which have a long straight fleece in a variety of colors. Maybe it all started when we moved out to the countryside in 1984. In the country you´re supposed to have animals. Somewhere I had read that you could make money from the wool of Angora rabbits. I decided to buy a few and before long I had plenty of them as well as scratches on my arms. You had to cut the fur by hand and the rabbits didn´t always agree with me on how this was going to be done.Howewer, I certainly didn´t get rich as many others had gotten the same idea and the price of wool dropped. After a while it wasn´t any point trying to continue. But I had lots of wool and started to spin, dye and design different patterns and found out that I really loved working with wool. At some time or another I learned how to “tova*” but not in my craft class. I didn´t make anybody happy there, especially not my teachers. It was a lot later that I learned how to “tova*”. Working as a music teacher I had to help out during a theme day to show the students how to do it. I got rid of my angora rabbits, bought sheep´s wool and got started. At first without any plans at all but then I found out about a Christmas fair to be held in Gislaved and made a few “tomtar”. To my great surprise people bought them and wanted more! Maybe this was going to amount to something? Selling my own crafts would be great but could I make a living doing it? Many different products were made in the neighbourhood. Some of the crafters I already knew and I established contacts with many others. I finally made up my mind to start my own business. We built a small workshop in 1993 and called it “Åsas Tomtebod”. Would I have been daring enough to take that step if my family hadn´t been in business since their youth? Maybe not so perhaps it all has it´s roots from my childhood? The workshop just barely made a living but my own products became very popular, I made jackets, boots, witches, trolls and “tomtar”. After a while I started to think that maybe not only people nearby would be intersted. I had already showed my products in Halmstad, Tällberg in Dalarna and in Gothenburg so maybe that was something to think about? I finally took the step and signed up for the big Formex exhibit in Stockholm. The year was 2000 and that was the start of the big change. When I got back from Stockholm I sold out everything that was left and the shop became the centre for the production of my own “tomtar”. It became “Åsas Tomtebod” for real and I had found my calling. * Tova- Mixing the wool with soap and warm water to make felt.